When you hover over the pictures little rings with links will appear. For now I’ve just posted a few places, and only in SL, but I’m hoping the blog will grow in time. I really appreciate the ability to link – something which I think will be a time saver – especially because you don’t have to log in to the blog to edit/remove links, you just need to be logged into Thinglink. 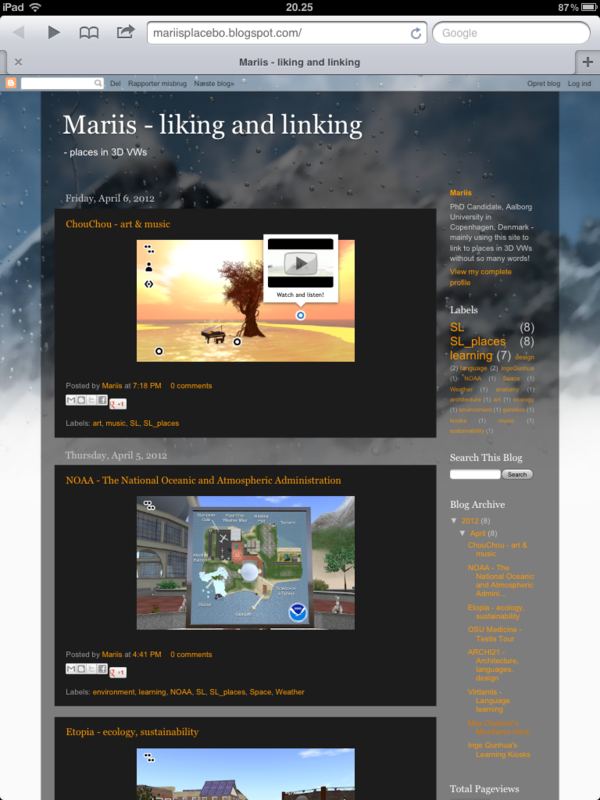 Thinglink is really, really easy to use – my only problem was that WP only allows the plugin on self hosted WP-blogs, so I had to create a new place and chose Blogger after trying a few other options. Evidently, Thinglink can be used for anything and the tool has already caught the attention of educators – see for instance @AuntyTech‘s Educate with Thinglink :-) W00T!